San Diego, CA… The San Diego Public Library will host a Filipino Book Discussion Series: Las Filipinas in the World featuring professor John Blanco of UCSD’s Literature Department in conjunction with the 2014 One Book One San Diego annual reading campaign at 6:30 pm on four consecutive Mondays between October 6 and November 3 at the San Diego Central Library @ Joan Λ Irwin Jacobs Common, located at 330 Park Blvd in downtown San Diego. Monstress, the 2014 One Book One San Diego selection by rising literary star Lysley Tenorio, is a book of quirky short stories set amongst Filipino-American communities in California and the Philippines, a thrilling debut collection of vibrant Filipino-American life. Professor Blanco begins the series with a discussion of the influence of Rizal’s books and their central role in the Filipino literary tradition. Come hear why Noli Me Tangere and its sequel El Filbusterismo are required reading for high school students in the Philippines. More than a century after its publication, Noli Me Tangere remains the most important Filipino novel ever published, and the most succinct symbolic drama of the Philippines at a crossroads between a decaying Spanish empire and the rise of European and U.S. imperialisms in Southeast Asia. Discussion of one of the masterpieces of Filipino literature, the epic poem: The History of Florante and Laura in the Kingdom of Albania (Pinagdaanang Buhay nina Florante at Laura sa Kahariang Albanya). Originally written in Tagalog by Filipino national poet Francisco Balagtas in 1838 while he was imprisoned by the Spanish colonial rulers. Balagtas is so greatly revered in the Philippines that the term for Filipino debate in extemporaneous verse is named after him: Balagtasan. Professor Blanco discusses two classic works by Filipino diaspora writers: America is in the Heart (1946) by pioneering Asian-American poet, novelist, and labor organizer Carlos Bulosan; and The Man Who (Thought He) Looked Like Robert Taylor (1983) by Bienvenido Santos, an important novel about the personal and emotional experiences of Filipino migrants in the U.S. Discussion of the works of three Filipina American writers including American Book Award recipient and human rights activist Ninotchka Rosca (State of War, 1988), celebrated novelist and playwright Jessica Hagerdorn (Dogeaters, 1990), and Palanca Award winner Marivi Soliven (Mango Bride, 2013). Dr. Blanco is a professor of comparative literature, Spanish, and cultural studies at UCSD. His research interests concern the colonial roots of globalization between the 16th-19th centuries. His courses engage with these themes in and through the study of Philippine, Latin American, Caribbean, and US minority literatures and cultures (religious, political, and artistic). Widely published, he is the author of Frontier Constitutions: Christianity and Colonial Empire in the Nineteenth Century Philippines. Visit him at: http://jdblanco.com. Library cardholders who would like to read the books in the series prior to the talks may borrow them from the San Diego Public Library. Online versions of Noli Me Tangere in the original Spanish, English, and Tagalog may be found at http://www.gutenberg.org/ebooks/20228. One Book One San Diego is an eight-year-old partnership between KPBS, San Diego Public Library, and San Diego County Library designed to bring the community together through a shared experience of reading and discussing the same book. One Book is made possible by the Linden Root Dickinson Foundation, Lloyd Pest Control, the Cubic Corporation, the Henry Fox Foundation, and the San Diego Public Library Foundation. Learn about One Book One San Diego and other programs at the San Diego Public Library’s Central Library and 35 branches, find links to numerous additional resources, or search for materials in the Library’s catalog online at www.sandiegolibrary.org. Imagine a play with 11 people — it’s not hard to do. 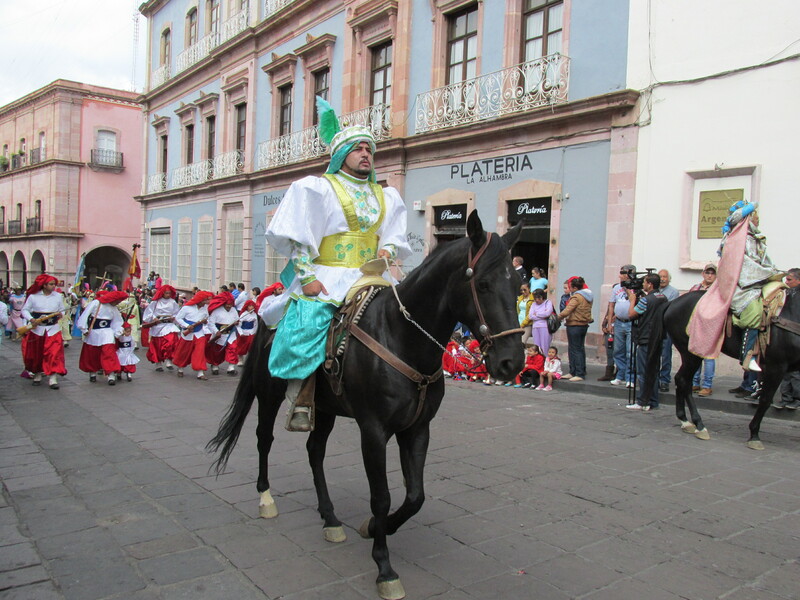 That’s how the revival of the religious “moros y cristianos” festival in Zacatecas began, in the 1950s — a colonial festival that commemorated the Reconquest of Spain in and through a retelling of its legendary roots (particularly the romance of Charlemagne and the Twelve Peers of France). 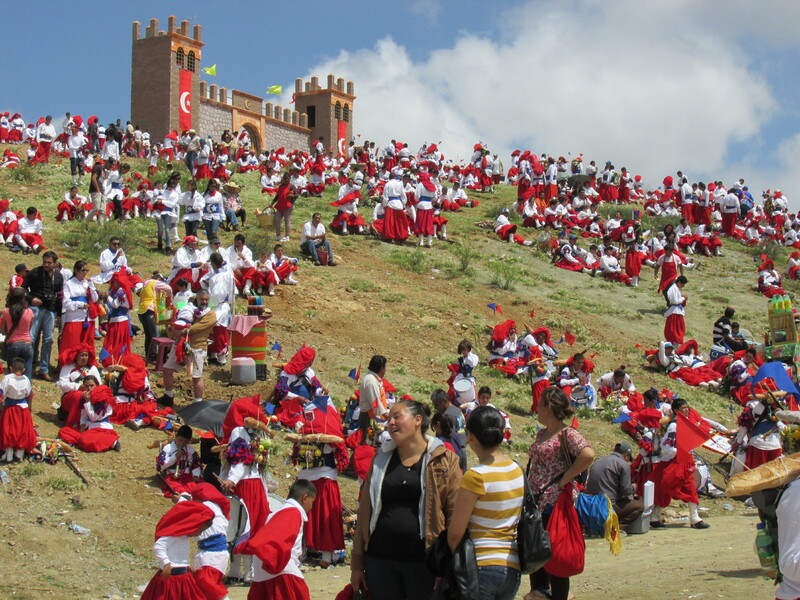 Known today as “Las Morismas de Bracho,” the festival takes place on the last week of August every year on the edge of the city. But let me return to our play of 11 actors. Multiply that number by 10 — that’s a lot of actors for a play, 110. Would you say a Broadway theater could hold that many actors? Decades pass, and now the number is 1100 — the only thing comparable to that would be the opening ceremonies of the 2008 Olympics in Beijing. 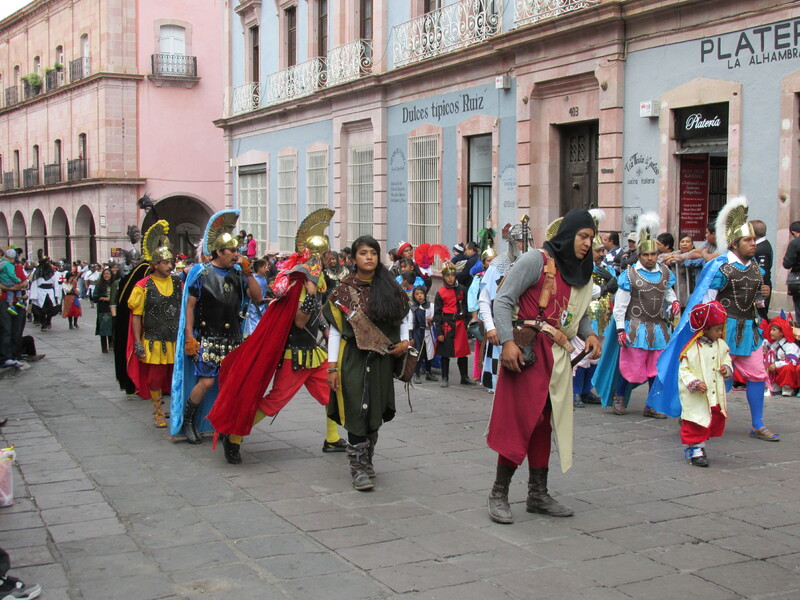 Hundreds of people in a procession marching through the town, in brilliant costumes representing everything from the Jewish subjects and Roman soldiers of King Herod in Palestine to the nineteenth century Turkish forces sent overseas by the French dictator Louis Philippe in order to install a French emperor in Mexico. I did mention the medieval knights too, right? A play with 1100 people, double that number. Double it five times. That’s (I think) 11,000 people. Add another thousand. Invite the families and friends of all those people. And let the play begin. 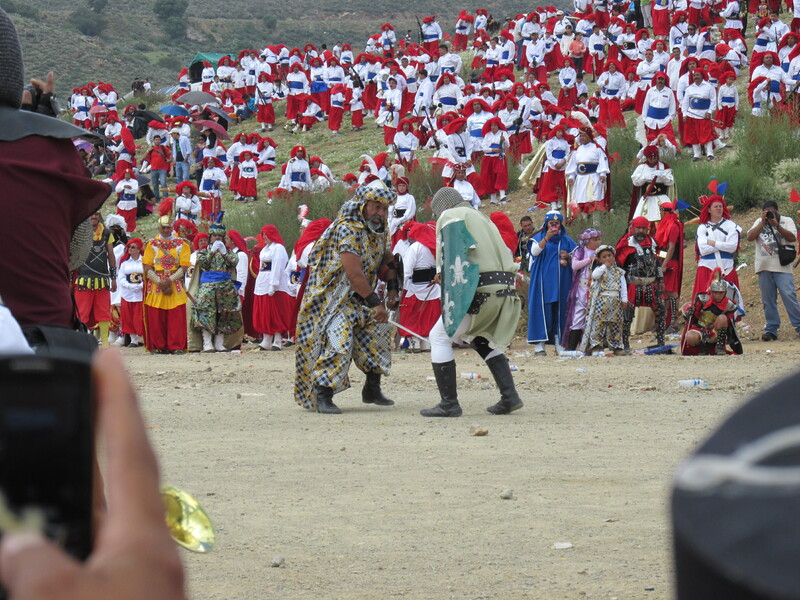 The festival takes place over the course of four days. 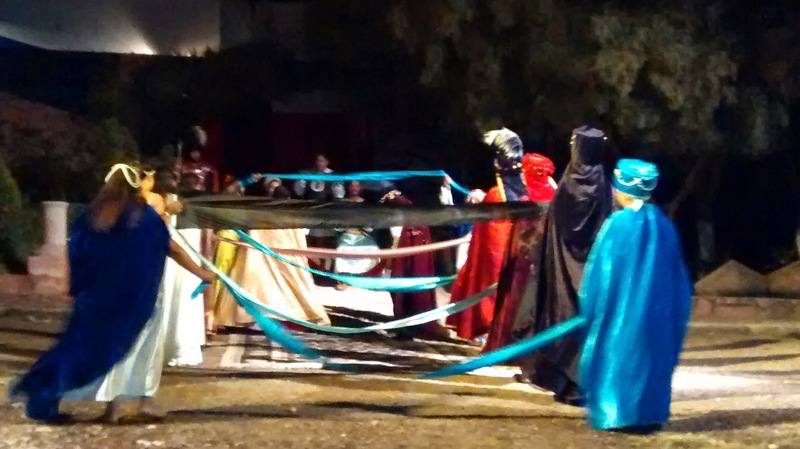 On Thursday, a small troupe of actors faithful to the veneration of San Juan Bautista — patron saint of the church, whose confraternity was created in 1824 in order to rectify the dissolute and reprehensible acts that took place around the parish during the days of the festival — stage the story of John the Baptist. 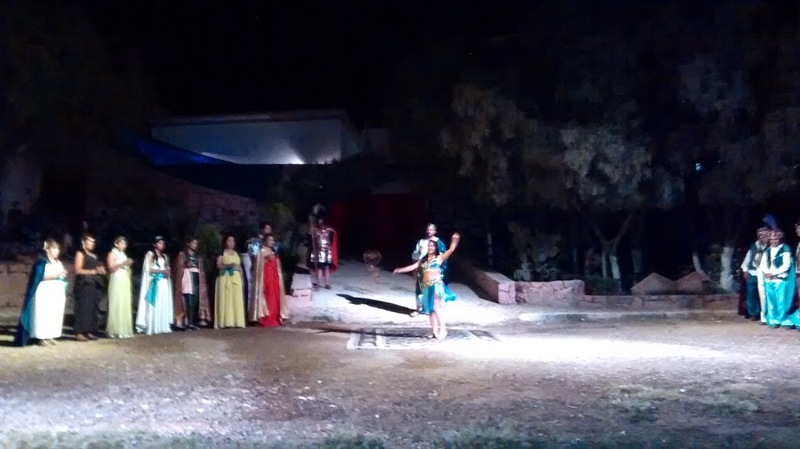 The play, which is done in an open air space not far from the church, tells the story of how Herod’s wife, an adultress who left her husband to be with his brother (Herod) uses her daughter Salome to ask Herod for the head of John the Baptist. Like most coloquios, there seem to be a lot of tangents that involve the Devil’s attempt to sabotage the redemption by killing John the Baptist; Herodías’s desire for fame and power (which leads to her adultery); and the play’s trovador, who in addition to accompanying the corridos with his guitar, also falls in love with Magdalena (another tangent! ), and confesses that he’s the illegitimate son of an important Roman official. Now what, you may ask, does all this have to do with moros y cristianos? Well, for one thing, the theme that ties together this play with the Morisma (in which Balan, leader of the Ottoman Turks is defeated by Charlemagne and his 12 Peers of France) is decapitation. Recall, the pre-Hispanic civilizations that had ceremonial centers just outside Zacatecas practiced human sacrifice, which also involved decapitation; and that as late as this past year, Zacatecas like other northern towns suffered from wars between drug cartels that resulted in decapitated heads left on the street. More directly, though, when the Ottoman Turks defeat the Christians and take the castle in the first battle, they capture the icon / statue of John the Baptist as their “treasure.” Tomorrow, when the Turks are being routed by Charlemagne, they cut the statue’s head off out of pure malice and frustration. 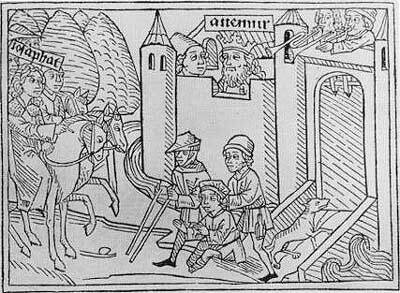 The story ends, of course, with the beheading of the Moorish leader Balan. Decapitation brings the story around full circle. The costumes are quite beautiful, especially against the stark background of the field stage. Throughout the play, there were a couple of funny moments that got people laughing: one was when Herodes goads Salome to sing (she has a voice that delights the heavens), but the girl playing Salome couldn’t really sing. When she’s finished Herod insists that she sing again, she does (the song is about how she’s being worked to death singing), then Herod waxes poetic about the beauty of her voice again, and when she asks him if he wants her to sing again he pauses, and says very abruptly “No!” at which point the audience burst out laughing. I think everyone was kind of relieved, although you have to remember that the girl who played Salome must have been barely 15 years old, so no disrespect to the fantastic job she did! Friday, Saturday, and part of Sunday are dedicated to the main story, which concerns: a) the conversion of the Moro “giant” Fierabras (son of the Turkish emperor Balan and brother of Princess Floripes) to Christianity; b) the seizure of Jerusalem, several knights of France, and the icon of John the Baptist by the Turks, launching Charlemagne’s holy war to recover the holy relics and the city (represented by a castle at the top of a hill); c) the assistance of Floripes, son of Turkish king Balan, in rescuing the knights and the relics, out of love for French knight Gui de Borgogne; d) Charlemagne’s confrontation with Balan in a one-on-one, mano-a-mano sword fight, leading to the Turkish emperor’s death and the rescue of the castle! Now wait a minute, you might say: “didn’t Charlemagne live 200 years before the capture of Jerusalem by the Seljuk Turks?” The answer of course, is: who cares? The adaptation of the “Twelve Peers of France” isn’t out to teach a lesson in history, but impart a set of values that arise out of the understanding of a Christian universe…. Ideally, of course. Festivals never become popular because some outpost Christian missionary priest struck upon a great idea and aggressively promoted it among the locals. What might have drawn Indian converts to these stories? 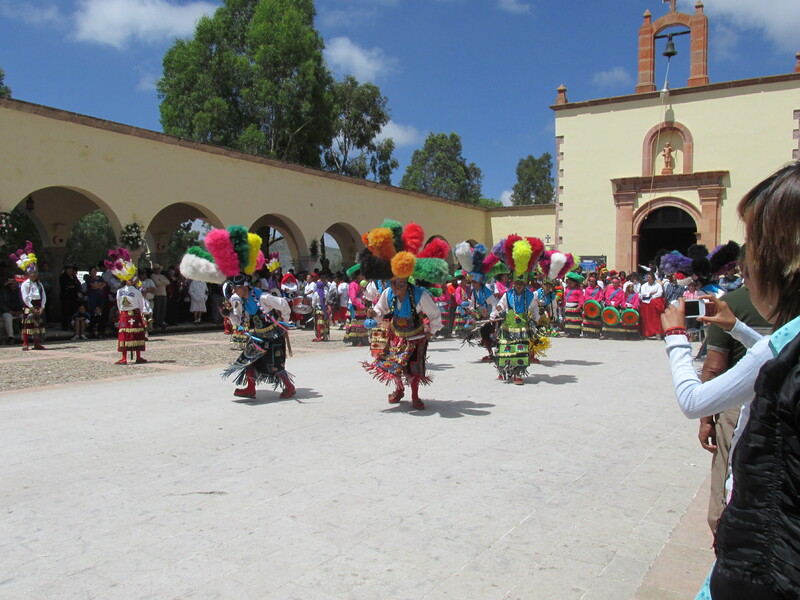 Janea Estrada’s recent article in La Gualdra, the cultural review of the Zacatecas edition of La Jornada (http://issuu.com/lajornadazacatecas.com.mx/docs/gualdra_163), gives us some clues: the desperation of the Indians, who died working 20 hours a day in the mines of Zacatecas; and whose numbers fell by 80% in the Americas within the first three or four decades of the conquest; the conviction that the simultaneous catastrophe that was the conquest and the discovery of silver in Zacateas led priests to believe that the Devil had relocated from the Ottoman Empire to Zacatecas, precisely one century after the Reconquest of Spain; the success at appropriating and repeating a European fantasy in order to mask the anger and bellicosity which, having no outlet, indigenous communities would visit upon one another; a legitimate pretext for continuing to practice the arts of war (similar to the history of Brazilian capoeira), through activities like juego de cañas (cane-stick game). There lies a will and an art in blurring and recombining the fragments of an indigenous universe that had been kicked to pieces, with the foreign, weak, inconsistent presence of conquistadors and missionaries outside Mexio City; until, between the danza de Matlachines (http://youtu.be/fvTYRRQ3Qxs) and the Battle of Lepanto, the clash of swords and the random crack and boom of gunpowder packed into toy muskets and cannons, the question of what is ultimately “native” and “foreign” becomes a labyrinth of contradictions (http://youtu.be/i78ZoDZsZjs). 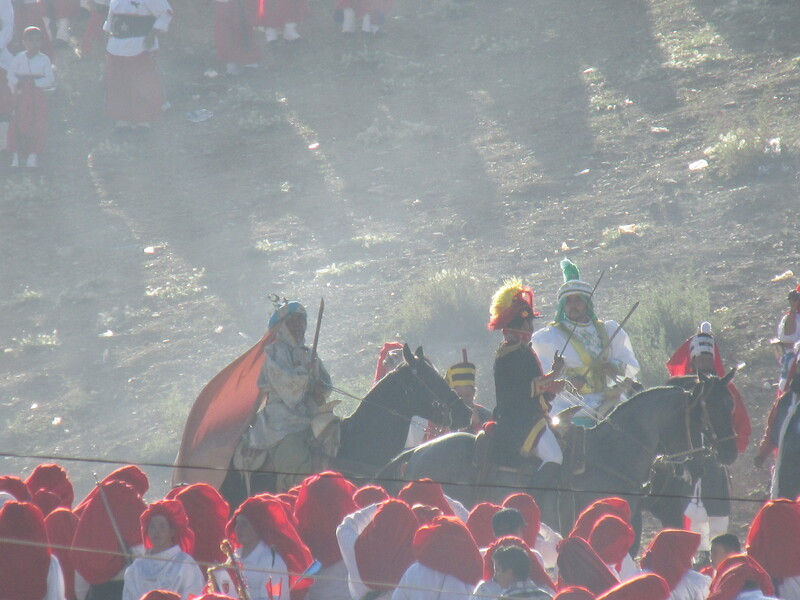 The final battle scene is a baroque spectacle: the Christian army forms the shape of a cross as they march in file slowly down the hill opposite to that of the castle held by the Turks. At a signal from the band, Christian troops swarm over the hill and around the cross, all descending upon the central field of battle where the final confrontation takes place. In it, Felipe II goes hand to hand with archenemey Argel Osman, and ultimately frees the captured Christian soldiers, as well as the head of San Juan Bautista. There’s a video of these two scenes here (http://youtu.be/Z2SbfeYYMok and http://youtu.be/uYT7IKnDPwI). Is the festival a placeholder for lost gods? The history of Mexico according to José Vasconcelos and the murallistas of the 1930s? Religious devotion? Or just a reminder of the state of exception having become the rule? You emerge from the day’s exercises, face and fingers black with gunpowder smoke, ears ringing, eyes stinging, drunk to hell. And all you want to do is to go back and do it again. Política común 5 (special issue: Carl Schmitt and the Early Modern World, edited by Jody Blanco and Ivonne del Valle) is out today!. Nomadism and Just War in Fray Guillermo de Santa María’s Guerra de los Chichimecas (México 1575 – Zirosto 1580) Sánchez-Godoy, Rubén A. Preface to The Planetary Tension Between Orient and Occident and the Opposition Between Land and Sea: reorderings and reorientations Blanco, John D.
In my “FAQs on the Theory and Practice of Literature” class the other day, we were reading this essay by historian of science Michel Serres called “Turner Translates Carnot.” The essay looks at Joseph Turner’s paintings as capturing the paradigm or “epistemic” shift brought about in Europe by the Industrial Revolution. 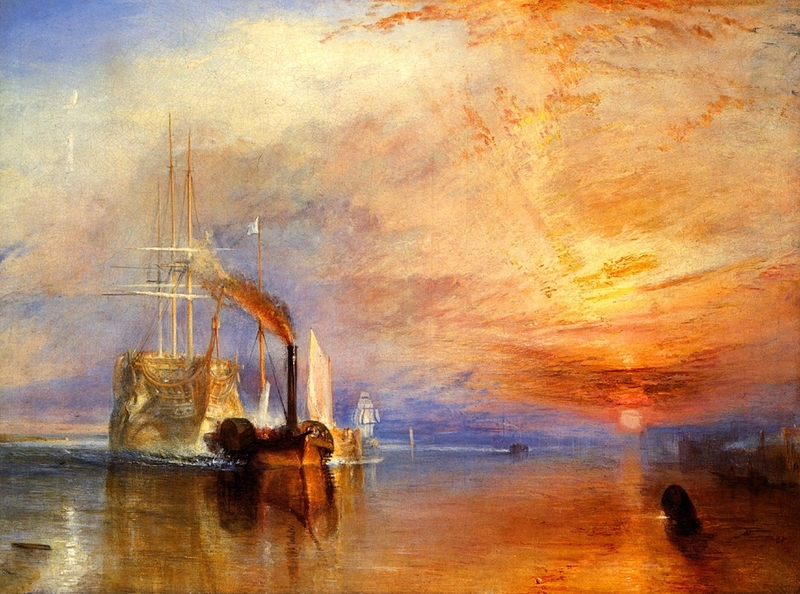 He argues that the new model of knowledge in Turner’s wake depends on the awareness, scientific calculation, and harnessing of stochastic forces, which can be juxtaposed with an older model of knowledge and technology based on the understanding and application of fundamental laws and principles of nature (think Bacon and Newton, and Kant’s 1st critique here). Horse vs. horsepower. Of course, it need not be said that in this respect, Serres’ interpretation of the Industrial Revolution parallels Marx’s interpretation of social revolution in the nineteenth century: “the revolutions of the 19th century” he said in 18th Brumaire (I’m loosely paraphrasing) “have to let the dead bury their dead. Before, the phrase exceeded the content. Now, the content exceeds the phrase” (sic). In a similar vein, Foucault had a longer (and long-winded, but also good!) extrapolation of this idea in Les mots et les choses. Out of the analysis of wealth, natural history, and the study of grammar come the three “positivities” of labor, life, and language, by which the “human sciences” are organized: economics and management, the health sciences, and philology. Anyway, I was looking around to find an easy illustration of a “stochastic” art in popular culture. Computer generated art seemed boring, so I turned to the use of feedback in rock music. I played them a song by My Bloody Valentine called “To Here Knows When,” where Kevin Shields uses a couple of pedals creatively to create a force field of sound, almost like a tsunami wave, that he directs in these pulsating modulations of feedback. Needless to say, it’s best played loud, it’s like this sonic roller coaster. It got me thinking: when did musical artists start incorporating feedback into their music as a central element in the composition? My first guess was Jimi Hendrix, although he can’t have been the first…. I’m going to have to do some surfing and research on this question. 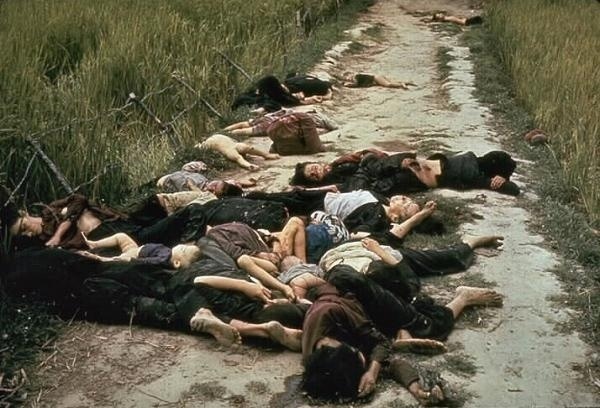 In the meantime, though, I flipped through my playlists and played one of my all-time favorite Beatles tunes you’ve never heard, because they never play it on the radio: “It’s All Too Much,” written by George Harrison. 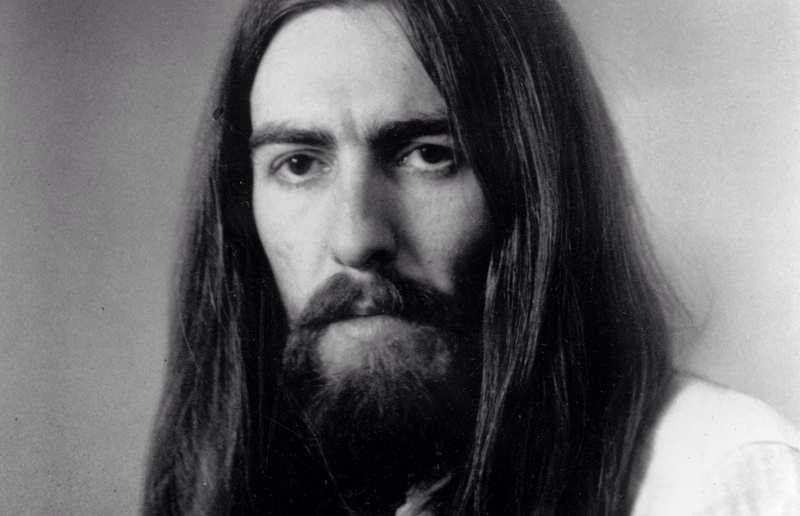 Interestingly, even though it was Paul McCartney who first came up with the idea of fooling around with tape loops, which the Beatles used in an original way in “Tomorrow Never Knows” from Revolver, I think it was George Harrison who found the most creative ways to incorporate the feedback drones and screams, as well as tape looping, into his music [postscript: I read a recent thread where someone said it was actually Paul who played lead guitar on the song, although someone else claims that some of the feedback was pre-recorded and then played backwards]. My theory is that he saw them as compatible with his new exposure and taste for Indian music and Indian tonal systems. Both represented a radical departure from the Western tonal system, but could be combined with it in different ways. Listening to “Only A Northern Song” and “It’s All Too Much” off the Yellow Submarine album, you can hear George trying to put all these elements into conversation. You would probably ask: “who has the time to come up with all that?” But the Beatles did: after years of playing ridiculous hours in German pubs and then cranking out albums only months apart, they told the world to f— off and spent the last half of the 60s in music studios experimenting with music and sound. 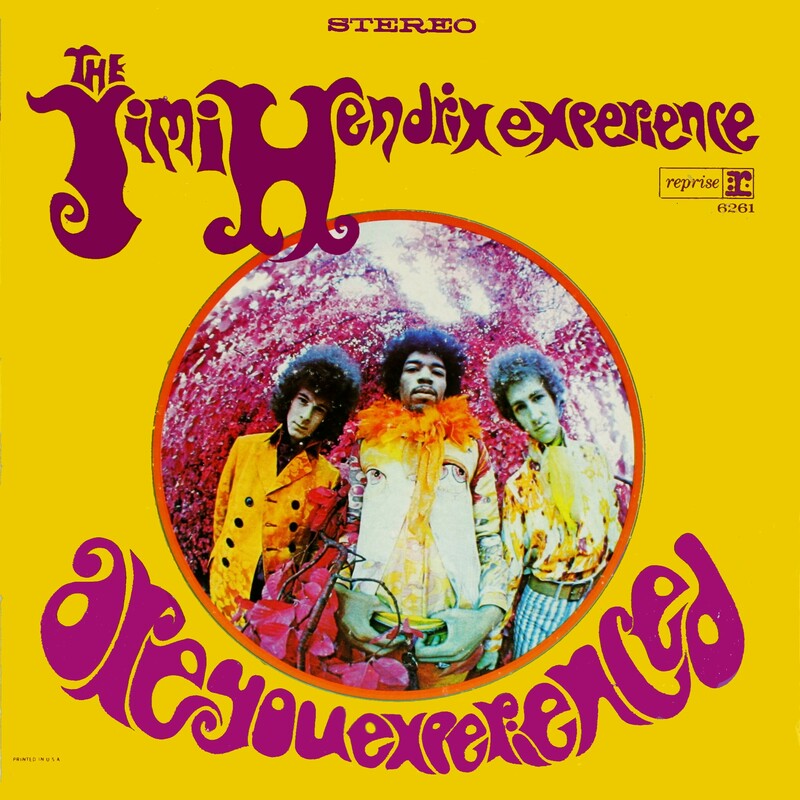 Jimi Hendrix and the Beatles should occupy two chapters in the history of feedback, their success at making feedback an actual aesthetic that was picked up and developed by psychedelic bands all over the world. All the indie bands of the 80s and 90s like Sonic Youth, Pavement, the Swans, and Mission of Burma (but also Prince) all loop through that bizarre transculturation of Indian music and the stochastic art of drone and feedback. It’s a trip. According to Allmusic‘s Richie Unterberger, the very first use of feedback on a rock record is the introduction of the song “I Feel Fine” by the Beatles, recorded in 1964. Jay Hodgson agrees that it was the first chart-topper to showcase feedback distortion, created by John Lennon leaning a semi-acoustic guitar against an amplifier. The Who‘s 1965 hits “Anyway, Anyhow, Anywhere” and “My Generation” featured feedback manipulation by Pete Townshend, with an extended solo in the former and the shaking of his guitar in front of the amplifier to create a throbbing noise in the latter. Canned Heat‘s “Fried Hockey Boogie” (off of their 1968 album Boogie with Canned Heat) also featured guitar feedback produced by Henry Vestine during his solo to create a highly amplified distorted boogie style of feedback. In 1963, the teenage Brian May and his father custom-built his signature guitar Red Special, which was purposely designed to feedback. Feedback was used extensively after 1965 by the Monks, Jefferson Airplane, the Velvet Underground and the Grateful Dead, who included in many of their live shows a segment named Feedback, a several-minutes long feedback-driven improvisation. Feedback has since become a striking characteristic of rock music, as electric guitar players such as Jeff Beck, Pete Townshend, Dave Davies, Steve Marriott and Jimi Hendrix deliberately induced feedback by holding their guitars close to theamplifier. Lou Reed created his 1975 album Metal Machine Music entirely from loops of feedback played at various speeds. A perfect example of feedback can be heard on Hendrix’s performance of “Can You See Me?” at the Monterey Pop Festival. The entire guitar solo was created using amplifier feedback. Who would have thought that St. Josaphat would be such an effective tool for converting Asians to Christianity during the 17th and 18th centuries? Well, the Jesuit missionaries did. Of course, nobody knew until centuries later that the life of St. Josaphat, a legend that became popular after the 10th century, was based on the life of Siddhartha Gautama, aka the Buddha!